These generous sized hotel suites are designed completely in white so that the sea and sky are reflected in every possible corner of the space, creative consideration having been given in the light of the fact that the suite is situated just a few meters from from the beach, the sea, the waves and the sky. 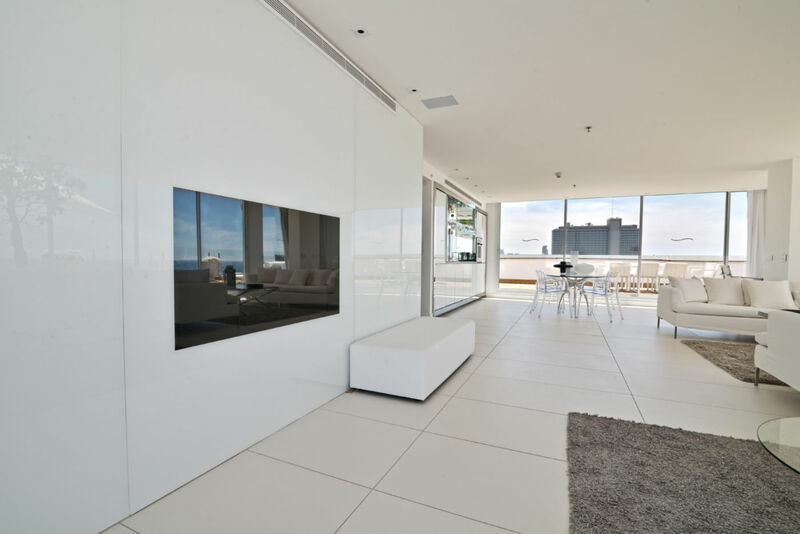 This is also the reason that the surface covering the television is made of clear, sparkling white glass coordinating perfectly with the minimalistic design of the room. Our TV surfaces are an innovative and decorative tool for integrating a television into any space. The surfaces are designed individually for each customer according to their specific requirements giving a technologically advanced look. Undoubtedly, glass TV surfaces furnish an elegantly decorated look to enhance any space.